Interactions between currents and flux harmonics may result in stray forces actuating over the motor causing mechanical vibration and further contributing to increase the overall noise levels. This mechanism gains importance especially when amplified by mechanical resonances within the motor or the driven machine. If any of the non-fundamental harmonics is near the natural frequencies of the motor, the forces produced can excite vibration modes. Such effects can be attenuated with a careful design of the motor with respect to the stator and rotor slots, lamination and frame, always looking out for simplifying the mechanical system thus reducing the possibility of exciting natural frequencies that develops modes of vibration within the motor. 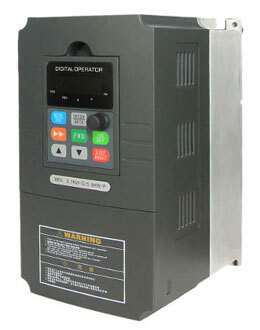 Modern Variable Frequency Drives (VFD) are also provided with tools to get those problems around, so that for instance specific frequencies within the operating range can be skipped and the acceleration/deceleration times can be conveniently adjusted. Tests realized with several motors and variable frequency drives following the procedures recommended by IEC 60034-14 confirmed that the vibration levels of induction motors increase when these are fed by VFDs. Furthermore, the observed increment on vibration speeds generally were lower with higher switching frequencies, that is, switching frequency increases tend to reduce the mechanical vibration of the variable frequency drive fed motor. In any case, even when operating above the base speed, motors presented RMS vibration velocity values (mm/s) below the maximum limits established by both the IEC 60034-14 and the NEMA MG1 Part 7 standards, thus attending the criteria required. NEMA MG1 Part 30 – When an induction motor is operated from a control, torque ripple at various frequencies may exist over the operating speed range. (…) It is of particular importance that the equipment not be operated longer than momentarily at a speed where a resonant condition exists between the torsional system and the electrical system (i.e., the motor electrical torque). (…) It also is possible that some speeds within the operating range may correspond to the natural mechanical frequencies of the load or support structure and operation other than momentarily could be damaging to the motor and or load and should be avoided at those speeds. NEMA MG1 Part 31 – Machine sound and vibration are influenced by the following parameters: electromagnetic design; type of variable frequency drive; resonance of frame structure and enclosure; integrity, mass and configuration of the base mounting structure; reflection of sound and vibration originating in or at the load and shaft coupling; windage. It is recognized that it is a goal that motors applied on variable frequency drive type supply systems for variable speed service should be designed and applied to optimize the reduction of sound and vibration in accordance with the precepts explained above. However, since many of these influencing factors are outside of the motor itself, it is not possible to address all sound and vibration concerns through the design of the motor alone. IEC 60034-17 – The asynchronous (time-constant) torques generated by harmonics have little effect on the operation of the drive. However, this does not apply to the oscillating torques, which produce torsional vibrations in the mechanical system. (...) In drives with pulse-controlled variable frequency drives, the frequencies of the dominant oscillating torques are determined by the pulse frequency while their amplitudes depend on the pulse width. (...) With higher pulse frequencies (in the order of 21 times the fundamental frequency) the oscillating torques of frequencies 6 x f1 and 12 x f1 are practically negligible, provided a suitable pulse pattern is applied (e.g. modulation with a sinusoidal reference wave or space-phasor modulation). Additionally, oscillating torque of twice the pulse frequency are generated. These, however, do not exert detrimental effects on the VFD system since their frequency is far above the critical mechanical frequencies. IEC 60034-25 – If the variable frequency drive have appropriate output characteristics and if due care is taken with respect to the mechanical characteristics and the mounting of the motor, vibration levels similar to those resulting from sinusoidal environment will be produced. Therefore, there is no need for defining vibration criteria different from those already established in IEC 60034-14 for sinusoidal supply. Vibration levels measured with decoupled motors are indicative of the motor quality only, but in measurements accomplished at the actual application (with the motor finally installed) rather different values of vibration levels may be obtained.